'Love of the common people' was written by John Hurley and Ronnie Wilkins. The lyrics tell a bleak story of poverty and joblessness. Though Wilkins and Hurley did not expressly say so in the lyrics, the song is also a protest of what they saw as the failure of the American government to do more for the poor and unemployed than it had. The track was originally recorded by Waylon Jennings in 1967, then covered by Nicky Thomas in 1970. 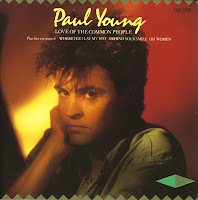 Paul Young released his version of the song originally in 1982. After it failed to chart, he had two hit singles with 'Wherever I lay my hat' and 'Come back and stay'. The track was re-released in 1983, and on this occasion it peaked at number 2 in the UK singles chart and topping the chart in Ireland and the Netherlands. This limited edition double single features three live tracks, with one clocking in at an impressive 9 minutes.